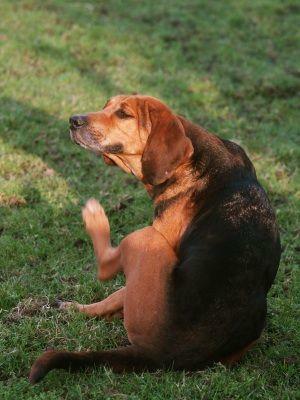 No matter where you live, fleas and ticks can be a problem. This tip from Wendy Nan Rees will help you keep these pesky critters under control without harmful chemicals. This recipe for flea repellant originally came from Kristen Leigh who wrote the book, Holistic Aromatherapy for Animals, and has worked with aromatherapy and essential oils for dogs for many years. It was passed on to me by my friend Russell Louis, and I modified it to make my own. I have used many different formulas over the years; many of them were my own mixes and very close to Russell's formula. What I like so much about Russell's formula is the Clary Sage oil that I had not tried in my many years of working with dogs. However, it works wonderfully well at repelling fleas. When mixing or blending any type of essential oils, make sure the area you are in is well-ventilated, and please make sure your dog has the option to leave the room or has plenty of fresh air moving around him. Remember that a dog's sense of smell is 100,000 to 400,000 times greater than ours. The scent of the oils are very strong to dogs and we should respect this. Leave plenty of room for your dog to exit the room if he wants to get fresh air. Also, whether using this recipe to make wipes, a spray or an herbal flea collar, it is important to always store all your leftover oils in dark, glass bottles in a cool dark room. This will help protect the life and the integrity of the product. Mix well by using a small hand mixer, available at any large drugstore chain. This will help blend the oils into an emulsion. It is important to keep them blended until you pour them over the wipes. This will help ensure you have spread the mixture evenly over all 100 wipes. Store them in the refrigerator, and they will stay fresh, as well as nice and cool, for your dog. When it comes to ticks, there is a completely different recipe and to be honest, this one really did blow my mind. I used my original flea and tick formula for years, and it wasn't until I met Russell Louis that I learned this one. I am sure that once you read the ingredients and try this recipe out, you too will be as surprised as I was. Mix well by using a small hand mixer, and immediately pour the oil over the wipes. Spread the mixture evenly over all 100 wipes and store in the refigerator. My dogs just love both of these recipes. I also use both of them as in-between bath wipes just to freshen up the boys. These wipes smell great, they have aloe in them that is great for their skin, and they help repel fleas and ticks and keep the dogs' coats feeling soft. A box of 100 wipes will keep in the fridge for at least three months if kept well-sealed. Just pull out what you need at each use. Please note: These wipes will only help repel fleas and ticks. If you already have a full on flea or tick infestation, go see your vet and proceed with whatever he advises you to do. In some cases when homes and pets are fully infested, sometimes other choices have to be made. There are green option out there for flea control, but you do need to call in a professional that you can find online or in the yellow pages. Also, ask your vet or friends for referrals. The all natural companies that come out to provide pest control can now be found in almost every state.